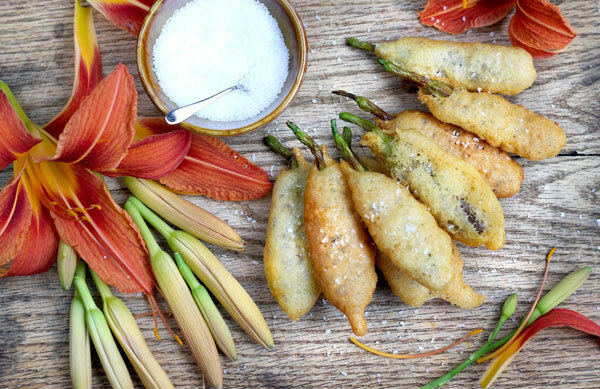 Summer flowers are not only fragrant and beautiful to look at, but some of them are also delicious to eat. I’m a long-time fan of cooking with flowers. On my blog, I’ve shared recipes for lilac scones, dandelion marmalade, and rose coconut semifreddo. But I haven’t yet shared my love for one of summer’s most prolific and yummy flowers: daylilies. Daylily flowers last only one day, hence their name. They bloom in the morning and wilt in the evening. But they are a prolific flower producer, often blooming for weeks on end. Daylilies are a popular staple in Asian cuisine and they are used both fresh and dried. 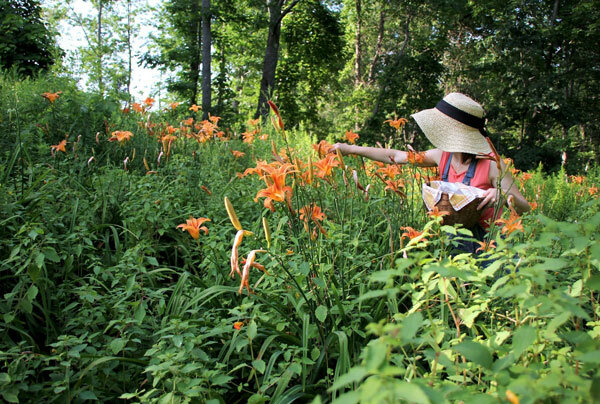 Every part of the daylily plant is edible: you can pluck the young shoots, boil the tubers like potatoes, or spruce up your salads with its bright orange petals. But my very favorite part is the flower bud. I find that the buds taste like a cross between asparagus and green peas and they’re lovely sauteed in a little garlic and butter. 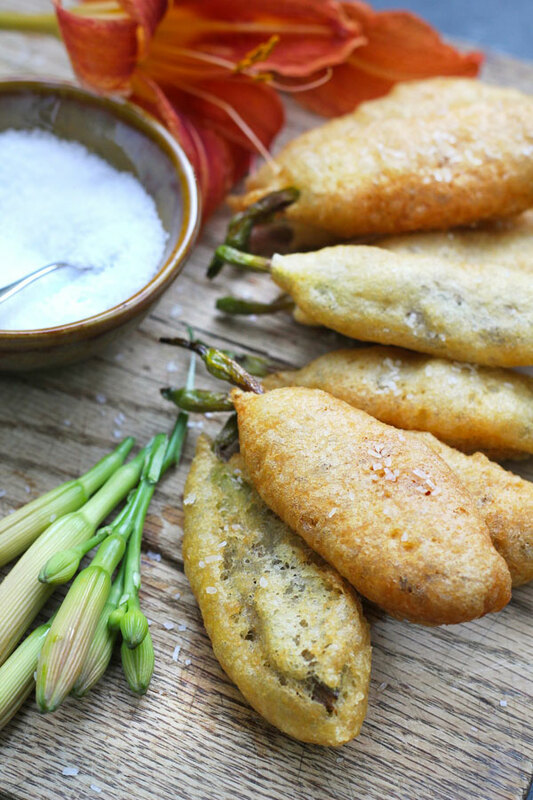 But dip them in a light batter, deep-fry them, and sprinkle a pinch of salt on top and you’ve got yourself a crispy summer treat like no other. You’re pretty much guaranteed to surprise your friends and family with this tasty treat. 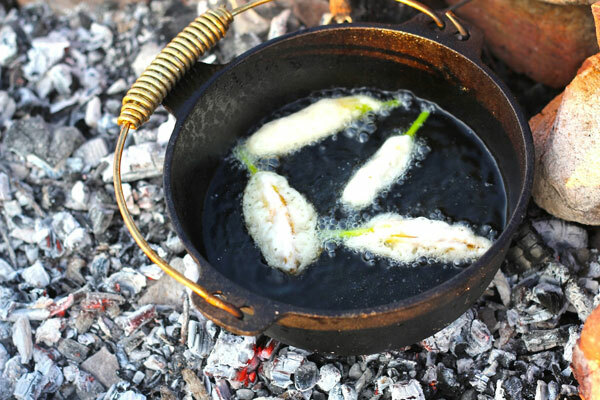 Many people have daylilies growing in their backyard, but you can also forage them in the wild and they’ll add some flair to your next camping meal! A few words about this recipe. I rarely deep-fry anything and when I do, I make sure to use a non-GMO oil with a high smoke point such as grapeseed oil or peanut oil. (Soy and canola oils are usually made from genetically modified crops, as are most generic vegetable oils on the market). The batter is very easy to make. It shouldn’t be too thick nor too liquidey. Aim for a consistency just a bit lighter than whipped cream. To give the batter some lift and flavor, I like to use a hard apple cider that’s got a bit of sweetness to it, but you could also use beer, soda water, or even champagne if you want to get fancy! 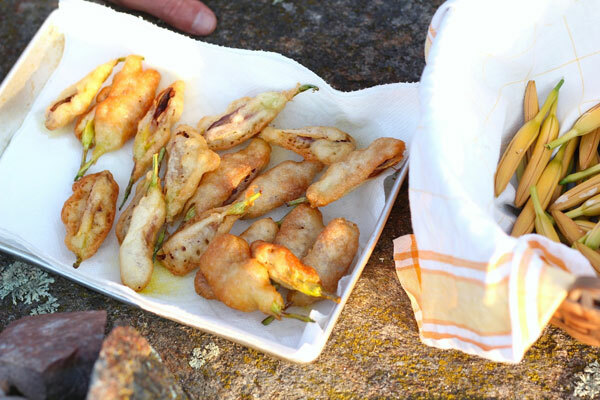 Of course, you don’t have to make your fritters over a campfire like I did in the video, but making these outside in the open air is a real summertime pleasure. If you do make them over a fire, be cautious with hot oil around any open flames. I find it’s best to allow your fire to burn down to coals, then scrape the coals aside to create a spot for your pot or skillet, that way you can bring more coals towards the pot if need be. The oil will heat up quickly over just a few hot coals. It’s also a good idea to have a splash guard on hand. A word of caution about daylilies: they are not to be confused with tiger lilies or commercial lily varieties, some of which can be toxic, so make sure you’ve properly identified them before eating them. As with any wild or foraged plant that you’ve never tasted before, it’s always a good idea to start with a small amount to make sure don’t have an adverse reaction such as an allergy or an upset stomach. The daylily plant is an edible flower that can be used both fresh and dried. The taste is somewhere between asparagus and green peas. In a small to medium-sized bowl, whisk the flour, baking powder, and salt together until fully mixed. Add 1 cup of cold apple cider (be sure it's ice cold as this will help your batter crisp up nicely) and gently whisk, being careful not to over-mix. A few lumps in the batter are ok and preferable to an over-mixed batter as you don't want the gluten to develop. In a small heavy skillet or saucepan, heat the grapeseed oil over medium heat. The oil should be just a little more than an inch deep and should reach a temperature of about 350 F to 375 F. I rarely take a temperature reading, instead I simply drop a bit of batter into the oil as a test. If it starts to sizzle and bubble right away, the oil is ready. It's important to make sure the oil is hot enough because hot oil prevents your batter from absorbing too much oil as it fries. 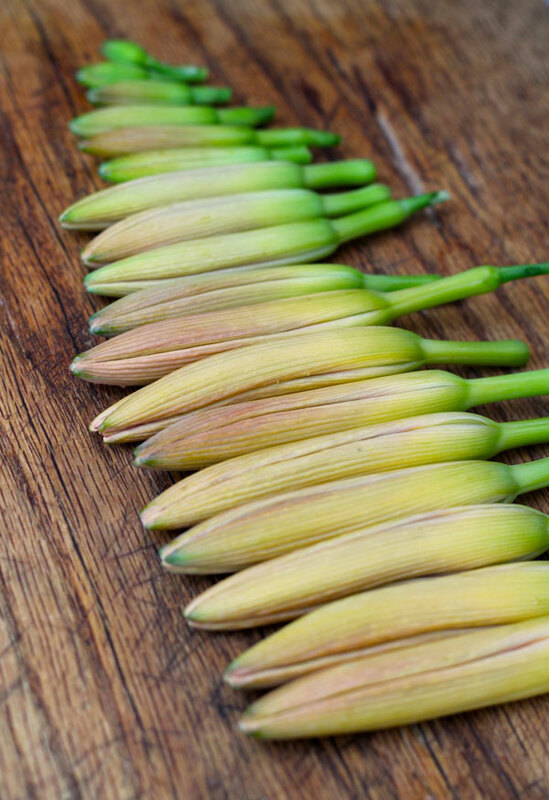 Once your oil has reached temperature, grab your daylily buds by the stem and dip each one into the batter. It's ok for the green stem to stick out of the batter, it will fry up and be delicious to eat as well. I find working in small batches is best, no more than 5 fritters in the oil at a time to properly monitor them. 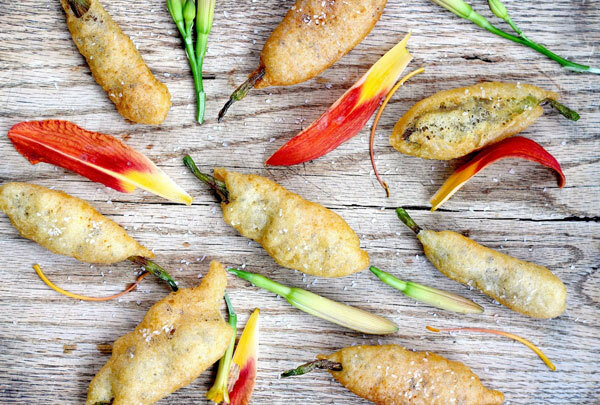 Drop each battered bud into the oil carefully to avoid splashing, and allow it to fry for about 1 minute or until crisp and golden, then flip it on the other side using tongs and fry it for about another minute. Remove the fritter from the oil and place it on a sheet of paper towel to absorb any excess oil. Eat warm, with a sprinkle of good salt or your favorite dipping sauce. 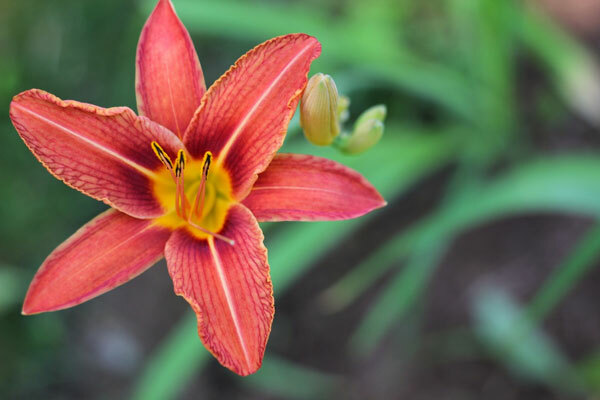 *A word of caution about daylilies: they are not to be confused with tiger lilies or commercial lily varieties, some of which can be toxic, so make sure you've properly identified them before eating them. As with any wild or foraged edible that you've never tasted before, it's always a good idea to start with a small amount to make sure don't have an adverse reaction such as an allergy or an upset stomach.